© Michael A. Williams, Ph. D.
harles Kingsley begins his lecture, "How to Study natural history" (later published in book form) by addressing a select audience on the relationships between inductive science, natural history, logical processes, divine creation and the imagination. But then he broadens his appeal and argues for tutoring all young people in an active approach to natural history. His radical ideas are, however, based on an imperfect understanding of the social realities of his time; he unnecessarily brings in examples of the exotic, to which his young audience can have had, as yet, no access; and, as well as arguing for the use of imagination, he encourages surmise — something that runs counter to the principles of an inductive scientist, and to the ideas that he himself expresses elsewhere. Binding of the 1872 edition of Town Geology, from the University of Toronto copy in the Internet Archive. To make geology universally accessible, Kingsley recommends removing financial obstacles by having his students rely on freely available materials. There is no point, he argues, in young men simply reading books as if geology were a passive indoors occupation. To become geologists, they have to think about what they have observed. And to observe, they have to go out (free of charge) "into the fields, the quarries and the cuttings, and most importantly see for themselves." Then they must supplement their field work by studying fossil and mineral specimens in local museums. The end is purely Baconian: they create a mental store of facts, not words. This will empower them to test "book truths," including the work of the highest authorities, against their own observations. 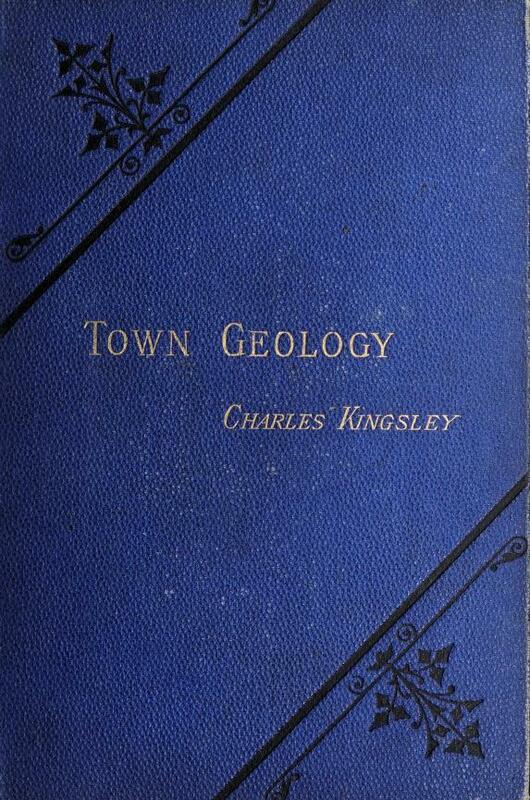 This, Kingsley asserts in his lecture on Town Geology, is the only way to learn how to "judge fairly and wisely of facts of any kind whatsoever" (p. 3). Kingsley ignores that those who cannot afford books, or are semi-literate, cannot choose between studying indoors or walking abroad. In fact, some would not even have the leisure to take a stroll. The same problem arises when he broadens his appeal still further and recommends that townsmen should "at odd hours" leave the urban grime and go to the countryside to keep "their bodies, their minds, and their hearts healthy and pure" and to collect specimens of natural history (5). Students of geology, who need to go out and observe the fields and the quarries, face the same difficulty as the townsfolk whom he advises, elsewhere, to visit art galleries, and enjoy pictorial representations of "mountain peaks, blushing sunsets, broad woodlands ... green meadows ... cool mellow shad ... overhanging rocks ... rushing brooks," exchanging "the city-world of stone and iron, smoky chimneys, and roaring wheels" for "the world of beautiful things" (Letters, pp. 168-69). Employees driven by economic necessity could expect as little opportunity for strolling in the countryside as for admiring artworks. Few in his target constituency would have the leisure to follow his suggestions. Future scientific development depends on the "civilised," for whom the study of religion and science would go hand in hand: no less an authority than Francis Bacon had decreed that studying the laws of physical science revealed "Vox Dei in rebus revelata" – "the Word of God revealed in facts" (p.9). If Kingsley sees natural history as becoming a key study for mankind, he surely has in mind the "civilised": such a study cannot be as "demotic" as his recommendations to townsfolk and his audience would imply. Nevertheless he insists that there is no shortage of natural history for anyone to observe. In that sense at least it can be demotic, especially since it need not involve the expense of foreign travel for, surrounded by a numinous world, students will gain a wealth of knowledge and an insight into "God’s Grandeur" even while staying at home. A simple English hedgerow yields wonders to scientific examination. The microscope reveals wood tissues and seeds that will inspire appropriate feelings ranging from an initial musing at discoveries to awe that the "smallness of size interferes in no way with perfection of development," because "Nature is greatest in that which is least." Not that "Awe," a feeling of the utmost humility in the face of Divine creation, counts as the most precious response: Kingsley feels that the chief gain is "that inductive habit of mind, that power of judging fairly of facts, without which no good or lasting work will be done, whether in physical science, in social science, in politics, in philosophy, in philology, or in history’ (pp. 12-13). The program is ambitious and potentially very demanding, yet he maintains a demotic emphasis, asserting that all young people, boys and girls, should have "an equal and sound education" whether their fathers are colliers or peers of the realm. Obviously a collier’s son will be handicapped from the beginning compared to a peer’s son, but, he implies, we should not disadvantage him any further through educational inequalities (p.16). Nonetheless, Kingsley has not avoided elitism and financial considerations. His programme may avoid further damage to the less privileged but leaves the highly privileged as they are — highly privileged. No matter how radical Kingsley can seem at times, he was Regius Professor of Modern History at the University of Cambridge, chaplain to the Queen, a private tutor to the Prince of Wales, and one the supporters of Governor Eyre’s reprisals after the Morant Bay Rebellion in 1865. He has, in fact, created a problem for himself: how to square his seemingly radical desire to popularise natural history as a discipline available to all with his vision of the "civilised" taking charge of future developments in natural history studies (p. 9). He also faces the question of who will make up the "civilised". But he has an elixir to hand: only in natural history can the poor "compete fairly against the rich." As he points out, the English Public Schools have neglected natural sciences in favour of the classics and team sports aimed to creating a "mens sana in corpore sano." This rigorous ethos governing behaviour, speech, and appearance, which aimed to inculcate the values of the ruling classes, has, however, created a unique opportunity the public schools do not have the lead in natural sciences that they have in many other areas. This idea that in natural history the poor might compete with the rich seems to create a level playing field, but it begs an all-important question. Granted that "Natural Science is a subject which you cannot learn by paying for teachers," and that you must teach yourself by "patient observation" and "patient common sense," what if the poor do not have a patience and common sense equal to the rich? Then, according to Kingsley, this must be their own fault and not their poverty’s because shops do not sell observation and common sense. This reasoning is highly questionable, since if there were such shops, poverty would still remain a problem. More important. such qualities are not commodities anyway, so it is disingenuous to imply, as he clearly does, that if the poor were not poor and could buy patience and common sense, all would be well. Thanks to recent research into the links between poverty and intelligence quotients, we can now confidently say that Kingsley is wrong to associate mental development and material well-being so simplistically. But we should recognise in his defence the limited understanding, in his own age, of the less obvious effects of being socially disadvantaged. 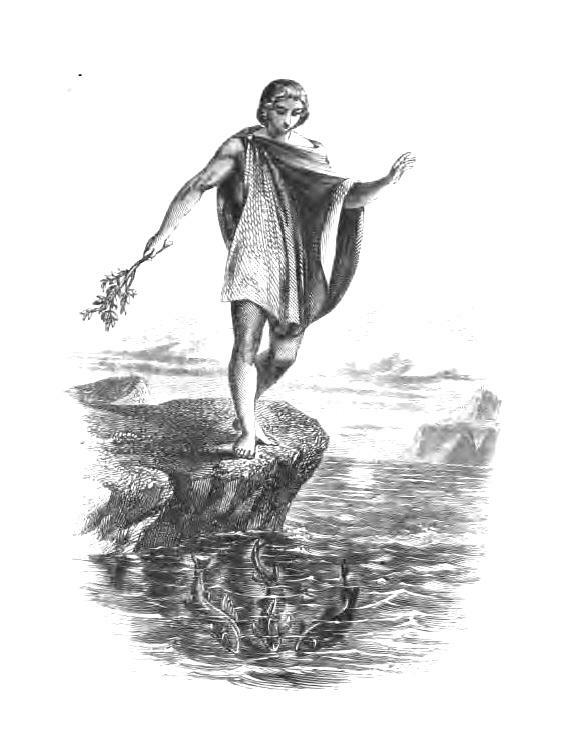 Frontispiece to the 1855 edition of Glaucus, from the University of Oxford copy in the Internet Archive. In fact, he has already tried to justify his assertion that only in natural history can "the poor man compete fairly against the rich," by presenting geology, rather disarmingly, as "perhaps, the simplest and the easiest of all physical sciences." It depends heavily on "common sense" (one of Kingsley’s favorite cards); involves fewer "difficult" experiments; doesn’t require expensive gear; and when starting his study, the student requires "less previous knowledge of other sciences, whether pure or mixed." He then draws a clear red line. Geology, he claims, is "freer from long and puzzling Greek and Latin words." This, in particular, makes it "the poor man's science’ (4). He develops this position by claiming that any student wishing to discover "the most important facts of geology" need know nothing about mathematics or chemical analysis — for one very simple reason: anyone with "eyes and common sense" can study these great facts in "every bank, every grot, every quarry, every railway-cutting." Budding geologists should follow the example of Hugh Miller (1802-1856), who "made himself a great geologist out of a poor stonemason." There is a well-founded tradition that while apprenticed in Cromarty to a stonemason, Miller took to strolling along the shore and visiting the local quarries, which inspired his interest in geology. While his six years’ stint as a bank accountant would not have endeared him to Kingsley, his later activities well qualified him as the ideal natural scientist which Kingsley describes in Glaucus. Geology may be as accessible as he asserts, but there are two snags in the way he presents his case: his statement that natural history has no "long and puzzling Greek and Latin words" is hard to square with his description of the grey snipe’s feather, an anemone which he does not hesitate to identify as Sagartia troglodytes, and its varieties, "the white-horned Hesperus, the orange-horned Aurora, and a rich lilac and crimson variety, which does not seem to agree with either the Lilacinia or Rubicunda of Gosse." He is quite happy to treat his audience to his use of a professional botanists’ terminology, classically derived names for "dawn" and "evening," and two extremely obscure Latinate names for varieties which are variously white, orange and reddish (p.116). The Lilicania and Rubicunda are, as far as I have been able to determine, varieties of Lathræa, a parasitic herb which lives on the roots of hazel trees, and is commonly known as "toothwort." It makes sense for the fully fledged botanical student to use the Latinate terminology but it would be more reassuring for a beginner to be introduced to it first by its everyday name. For an adult as well read in the classics and as interested in words as Kingsley, the etymology of "Sagartia troglodytes" offers a delight: from a Latin adjective "troglodyta," derived from a Greek adjective τρωγλοδύτης, which combines "τρώγλη" (hole) and "δύειν" (to get or go into). Hence its use as a "cave-dweller" from which we have derived "trogs" to mean people who lead degraded lives in slums (along with other very unpleasant usages deriving from the anthropoid ape of the genus Troglodytes, a gorilla or chimpanzee). This may have intrigued a classical scholar like Kingsley, but it is not strictly within a geologist’s remit. The second problem again concerns audience and appropriateness of language. He may as well be addressing well-informed fellow Cambridge alumni rather a general assemblage of young men. Furthermore, although he has claimed that natural history is accessible to all, he allows only a select few an involvement in future scientific development. In fact, he envisages a corporate takeover by the professional scientific community whom he defines as the heirs of "the philosophers of the seventeenth century" (p. 22). The "great heirloom" to which he refers is, of course, Baconian inductive science, which relies on direct observation and careful experiment. Bacon can be credited with having produced the first fully articulated rationale for collecting material evidence to verify deductions and explanations: "general statements come out, not notional, but well-defined, and such as nature may acknowledge to be really well known to her, and which shall cleave to the very marrow of things.... General statements depend on the accumulation of accurate observations and careful experiments" (Bacon, 119). Kingsley has this in mind when he frequently counsels his audience to learn the first principles by direct experiment, and tells them not to sit at home reading a book about geology but to go out on a rainy day — the rainier the better! Once out and about, they are to find running water and then they will "see in little how whole continents are made, and unmade again." At first his instructions are to maintain direct contact with the immediately visible and tangible, i.e. not to lose sight of the facts. They must watch the rain separating the finer particles from the coarser, carrying the former downward with it toward the sea. The water will drop the pebbles the moment it enters the pond, then it will drop the sand, and then the fine mud which it carries in suspension will gradually drop on to the bottom of the pond. So far, so simple, and so observable, but then problems occur. He has invited his students to use their imaginations and to "see in little how whole continents are made, and unmade again." "Had we but world enough and time...!" These are what neither they nor Andrew Marvell’s lover have, an acute problem when geologists were measuring geological development in aeons of time which challenged anything sanctioned in Holy Scripture. Since his students do not have aeons, he plays another of his favorite cards much favored later by Arabella Buckley – imagination or the "fancy." He does, after all, comment in Glaucus that "we cannot wonder at finding that books which treat of (natural history) carry with them a certain charm of romance, and feed the play of fancy, and that love of the marvellous which is inherent in man" (p. 195). Following this up, he asks his students to play with their fancies and imagine that "the sands which cover so many inland tracts were dropped by water, very near the shore of a lake or sea, and by rapid currents." Then he asks them to imagine that the brick clays which often mingle with the sands have dropped into deeper water farther from the shore. He increases his demands on them and tells them to imagine that clearing out a pond has revealed under the lowest layer of mud "a layer of vegetable soil, with grass and brushwood rooted in it." What began as an experience of direct observation has, of necessity, become a matter of surmise, and his question invites speculation: "The pond has not been always full. It has at some time or other been dry enough to let a whole copse grow up inside it." But how? He asks this question in such a detailed manner as to invite the right answer. They are to suppose that under some sand hills, they find the following sequence: a bed of earth with shells and bones; a bed of peat; one of blue silt; a buried forest, with the trees upright and rooted; another layer of blue silt full of roots and vegetable fibre; another old land surface with trees again growing in it; and under all the main bottom clay of the district. He again plays another favorite card: "what would common sense tell you?" (p.42). Common sense might tell you what the professional geologist would — that in your mind’s eye you are imagining stratification! Asking his audience to imagine a pond clearing presents no particular difficulties if there is a pond handy and workmen are clearing it. But there is a difficulty when you want to take your observation of geological phenomena onto a global scale, and this is what he does in section three, "The Stones in the Wall," where he deals with red sandstone. First, he deals with the local and the way in which red sandstone covers a vast tract of England. He traces its whereabouts from the mouth of the Tees, down through Yorkshire and Nottinghamshire and over the manufacturing districts of central England, and on down the Severn Valley, then north-westward through Shropshire, Lancashire, the Lake District, to the Scotch side of the Solway Frith. He comments that "everywhere the coal-bearing rocks rise as from a sea" but, oddly, he does not mention William Smith (p.47). He can assume that his audience is familiar with the names in the British landscape which he asks them to imagine traversing, but when he tries to take things to a global level, he can longer ask his audience to "suppose." He has to finish with that tactic. Instead, he has to offer them information about deposits of rock-salt, and admit that he has never himself "observed" such deposits as natural facts. As he does with the pebble’s tale, as a substitute for first-hand observation, he quotes from books written by geologists who have surmised that salt is not at the bottom of the sandstone but underneath the red marl. He does not tax his audience as he might have done with fact by defining marl for them: i.e. types of sand-stone, lime-stone, and other stone deposited in the strata in the shape of a white, chalky deposit consisting of the remains of mollusca, entomostraca, and fresh-water algæ. Instead he postpones the moment when they will have to master such language. and engages them in surmise about the origins of salt. Since no one could have observed how salt originated, Kingsley suggests to his audience that the salt was probably produced when the lagoons dried up, a process said to be happening as he speaks in the Gulf of Tadjara, on the Abyssinian frontier opposite Aden, and in the Runn of Cutch, near the Delta of the Indus. He then quotes others’ speculations that the New Red sandstones may be "the remains of a whole Sahara, lifeless deserts, reaching from the west of England into Germany, and rising slowly out of the sea; to sink, as we shall find, beneath the sea again" (pp. 86-7). He is, in effect, offering a mixture of surmise and "fact" — geological speculations about past processes and observable phenomena in specific contemporary geographical locations. The global extent of his geographical references obliges him to call on his audience’s imaginations, but in front of a young male audience from the Chester Society for Natural Science, Literature and Art which he founded, he has to limit his use of this tactic. Since his audience were young men, their familiarity with Asia and Africa may have been as yet limited to travellers’ diaries and atlases, and perhaps they could no more at first sight tell the Gulf of Tadjara from the Runn of Cutch than they could tell Actinia Mesembryanthemum from Sagartia Aguicoma! He restores his audience to familiar surroundings and takes up his earlier suggestions that one way to learn is to observe your immediate surroundings. Yet even here he asks the audience to use their imaginations by asking them to consider "an imaginary railway journey to London from any spot in the manufacturing districts of central England." Many of them would surley have been familiar with such a railway journey, but this is entirely different from envisaging the Gulf of Tadjara. But whatever demands Kingsley makes, one is constant: to use their imaginations, and to keep their eyes open as they travel. He berates those who don’t. For instance, he offers a few strictures about "young people rolling along in a luxurious carriage." Their transport may be expensive but their taste is execrable as they absorb themselves in "a trashy shilling novel" completely unaware of the beauties through which the train is travelling: "the reverend antiquities, the admirable agriculture, the rich and peaceful scenery, the like of which no country upon earth can show.". They do not realise, he complains, how much they might be learning about botany and zoology if they simply watched "the flowers along the railway banks and the sections in the cuttings." Kingsley seems genuinely upset, if that is not too gentle a word, as he condemns those who waste their heaven-sent gifts: "it grieves me to see what little use people make of the eyes and of the understanding which God has given them." He is also disgusted by their lack of honest self-awareness. They may complain about a dull journey but do not realise that it they who are dull; they may have eyes and ears but they do not see or hear. He sums them up succinctly and scathingly: "mere dolls in smart clothes, too many of them, like the idols of the heathen" (p. 89). In his lecture, Kingsley has recognised two important matters: first, that as a speaker on natural history he has encompassed both the exotic and the local; second, he has been qualifying his stated principle that the student should, like Miller, be an autodidact. His first claim creates a peculiar difficulty. If what you find your immediate surroundings a rich enough resource, why bother with exotic locations? Yet he suggests that that is exactly what you should do in your imagination. He takes his cue for one such imaginary trip from the question of how the limestone got into the limestone quarry in the first place. Briefly, he reflects on his own methodology — "leading you, as before, from the known to the unknown." Now he recognises that the places which he will ask them to imagine may be unknown "to most." But, moving carefully, he hopes that there might be soldiers or sailors among his readers who know the places which he will mention far better than he does himself. He clearly already has in mind the future publication of his lecture to a wider audience, but, for the moment, when he mentions some island in the Tropic seas he reassures his audience that he is not leading them "as far away as you fancy by several thousand miles, as you will see, I trust, ere I have done" (p. 91). He has, as it turns out, led them no further than the Coral Rooms of the British or Liverpool Museums! Dealing with the origins of limestone obliges him to introduce sea-anemones and their shells and for that you do not have to use your imagination — you can visit two major collections in Liverpool and London. But, and it is a big but, it is not as simple as that. The students will not be encountering living flora in their natural habitat. Therefore they must use their imaginations and "re-clothe each of those exquisite forms with a coating of live jelly of some delicate hue, and put back into every one of the thousand cells its living flower; and into the beds, or rather banks, of the salt-water flower garden" (p. 92). Thus far, he has engaged his students in an exercise in which they imagine or re-create the exotic. Now, having guided them through an exotic voyage, he returns them to the local and the familiar. Perhaps it might have been better for him to have started with "the gaudiest of shell-less sea-anemones, such as we have on our coasts rooted in the cracks." In familiar surroundings, students would observe not only the sea-anemones but "fifty other forms of fantastic and exuberant life." So there has been no need to take an imaginative trip to an exotic island of indeterminate size to see "The fish, especially the parrot-fish," spending their lives in "browsing on the live coral, with strong clipping and grinding teeth, just as a cow browses the grass, keeping the animal matter, and throwing away the lime in the form of an impalpable white mud, which fills up the interstices in the coral beds" (Town Geology, p. 130). Kingsley offers an indirect apology for the unnecessary exotic island trips in his use of the analogy of a homely image of a homely cow browsing to explain the presence of lime in the coral beds. Still moving between the familiar and the exotic, he turns, à propos of creatures you would find in a coral reef, to the Brachiopod, a bivalve mollusc with long spiral arms either side of its mouth for grabbing at its food. This gives him his cue for an implicit and approving nod in Charles Darwin’s direction. He describes the Brachiopod as "a family with which the ancient seas once swarmed, but which is rare now, all over the world." The reason which he adduces is authentically Darwinian. It has been "supplanted and driven out of the seas by newer and stronger forms of shelled animals." He also combines the unusual and the familiar when he tells his readers that they can dredge a Brachiopod from the deep water of Loch Fyne in Argyleshire in Scotland, and that the great Sir Richard Owen (1804-1892) had been overjoyed when he saw "the same lingering remnants of a primeval world" being dredged up from the Loch (p. 131). Kingsley also offers anecdotes which are strictly exotic. He instances dredging for Brachiopods off the coast of Portugal and off a Caribbean island where you might find a live Crinoid (a lily-shaped echinoderm). Again returning to Darwin, he informs his readers Crinoids are all but extinct although "fifty or a hundred different forms of the same type swarmed in the ancient seas." He does not explain how he knows how many different Crinoids "swarmed in the ancient seas" but he explains why he has diverted his reader with the two anecdotes: "whole masses of limestone are made up of little else but the fragments of such animals" (p. 131), and deposits of lime under the influence of the sun and rain behave like cement and set as rock (p. 132). Kingsley uses imagined exotic trips to answer to the question, Why should not the domestic limestone have originated by the same process that placed old coral beds on mountain sides in the West Indies and elsewhere; namely, by the upheaving force of earthquakes? The answer for him is clear: there is no reason to suppose otherwise. He is partly following scientists like Hutton here since the latter explained past events by an inductive analogy with what you can observe in the present and what you can observe of resulting formations (Gillispie, p. 47). Kingsley has used induction by analogy slightly differently — speculating about present formations in English limestone quarries on the basis of speculations about old Caribbean coral beds ending up mountains, as a result of supposed earthquakes. But he has not moved beyond the formation of imaginative surmise to the Baconian world of observed "fact." Professor Ptthmllnsprts in a later (188?) edition of The Water Babies, illustrated by Linley Sambourne, from the New York Public Library copy in the Internet Archive (p. 165). His dealing in surmise rather than observed fact in explaining the limestone quarries needs to be qualified, and he himself, with his extravagant valuation of the imagination, provides the criterion for qualifying it. If you take him at face value and accept that there are more things in Heaven and earth than are dreamt of in our philosophy, then there is always every reason to suppose otherwise. In one sense, he has hoist himself with his own petard and commits the fault for which he castigates Professor Ptthmllnsprts in The Water Babies. The Professor consistently maintains that "no man was forced to believe anything to be true, but what he could see, hear, taste, or handle." This is why he cannot accept the world of nymphs, satyrs, fauns, inui, and so on which he dismisses as "pure bosh and wind" (p.82). To the empiricist, such a fantastical world will be "pure bosh," but it is the product of the imagination, and blindness to the imaginative characterizes Ptthmllnsprts’ absurdity. In fact, the fairies had turned him into a water-baby. A water-baby? You never heard of a water-baby. Perhaps not. That is the very reason why this story was written. There are a great many things in the world which you never heard of; and a great many more which nobody ever heard of; and a great many things, too, which nobody will ever hear of, at least until the coming of the Cocqcigrues, when man shall be the measure of all things. "But there are no such things as water-babies." How do you know that? Have you been there to see? And if you had been there to see, and had seen none, that would not prove that there were none. [The Water Babies p.38, 2013]. 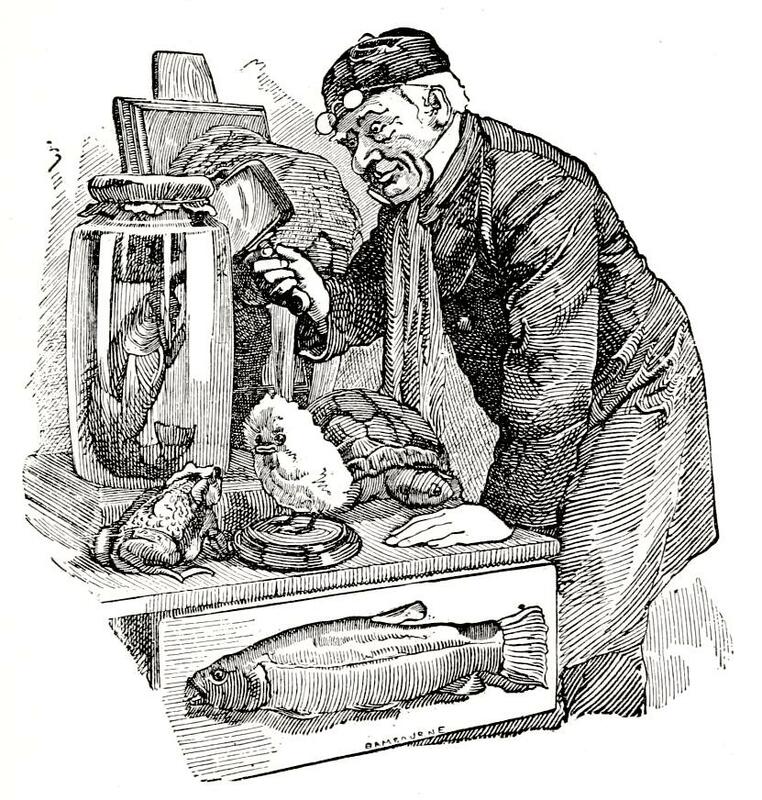 Unlike Mrs. R. in Granville Penn's Conversations on Geology, Kingsley as narrator answers his young listener’s question very patiently, and argues that, if you have not seen a water-baby, this does not mean that they do not exist because "there are a great many things in the world which you never heard of." In other words, do not close your mind, as Ptthmllnsprts does. Unfortunately, Kingsley’s statement about the reasons why a man has died in circumstances similar to those of a man who has definitely fallen off a roof calls into question the proposition he advances: i.e. "The answer is clear — there is no reason to suppose otherwise." He means to bring this passage to an authoritative close, by working on a simple principle: "When you see similar effects, you have a right to presume similar causes. If you see a man fall off a house and break his neck, and then see another lying at the foot of a house and his neck is broken, then it is a fair presumption that he too has fallen off a house. There may be some other cause but you have to prove it, and the judge and jury are Science and Common Sense which insist that the man fell off his house till someone proves that he did not" (pp. 133-34). But once again Kingsley has hoisted himself with his own petard. Saying that "there is no reason to suppose otherwise" distorts the issue and reveals an astonishing contradiction here in his thinking. Quite simply, this is not how a self-avowed Baconian inductive scientist works. A Baconian Natural Scientist does not fix an opinion on his first encounter with a phenomenon, and wait for it to be disproved. He starts by gathering as much relevant evidence as he can. From considering this, he seeks to discover how nature works and then constructs laws and theories. But here Kingsley is recommending that you base an assumption about an incident which you have witnessed on another incident of which you have witnessed only the result. He bans further speculation. An inductive scientist, turned detective, might want to ask whether the man has been violently assaulted. Was he thrown out of a horse-pulled vehicle? Was he knocked over by a horse? Are there any other facts to go on? Eye-witnesses, for instance? Closing down the possibilities most surprisingly circumscribes the operations of the imagination and runs counter to important aspects of Kingsley’s thinking elsewhere. Bacon, Francis. Distributio Operis ed. Thomas Moffett. Dublin: Dublin University Press, 1847. Buckley, Arabella. The Winners in Life's Race or the Great Backboned Family. New York: D. Appleton & ompany,1883. Buckley, Arabella. The Fairy Land of Science. Oxford: Oxford University Press, 1879. Carlyle, Thomas. Translations from the Germans Volume 3. London: Chapman and Hall Ltd, 1827. Gillispie, C. C. Genesis and Geology. Cambridge: Harvard University Press, 1969. Kingsley, Charles. Glaucus or, The Wonders of the Shore. ed. Brian Alderson. Oxford: Oxford University Press, 2013. Kingsley, Charles. His Letters and Memoirs of His Life: Volume 1. edited by his wife. London: Henry S. King & Co, 1877. Kingsley, Charles. How To Study natural history. Great Britain: Amazon, 2016. Kingsley, Charles. Town Geology. London: Henry S. King & Co, 1872. Kingsley, Charles. The Water Babies. Oxford: Oxford University Press, 2014. Macaulay, T. B. History of England from the Accession of James the Second. Volume 1. London: Longman, Brown, Green and Longman,1849. Opie, Peter and Iona. The Classic Fairy Tales. New York: Oxford University Press, 1980. Penn, Granville. Conversations on Geology comprising a familiar exposition of the Huttonian and Wenerian System; The Mosaic Geology, as explained by Mr. Granville Penn; and the late discoveries of Professor Buckland, Humboldt. R. McCulloch, and others. London: Samuel Maunder, 1828. Torrens, Hugh. Images of the Earth: Geological Communication. Buckinghamshire U.K: British Society for the History of Science, 1981.